One almost grimaces at the sight of the oft-used cliché life changing, but when it comes to the films of Werner Herzog, there is no term more suitable than this. I came to Herzog anachronistically. A few years ago I was introduced to the most beautiful documentary I had ever seen, Cave of Forgotten Dreams, and have since then been working back through the filmmaker’s extensive catalogue. But one does not simply ‘see’ a Herzog film. Rather, they traverse an experiential and multi sensorial journey, and emerge from the other side somewhat transformed – existentially, emotionally, ontologically. Of course, I will not appeal to the taste of the majority when I speak of the transformational nature of the German filmmaker, but this post is more of a reflection on how his art has impacted me personally, and connects to the greater inquiries of the Metamorphosis Project in terms of collaboration and the interconnectivity of research and art. During the early conceptual stages of this project, I was intensely inspired by Herzog’s work, by the soul-awakening scores of Ernst Reijseger, and by a number of literary texts, most poignantly Ovid’s Metamorphoses. Last week’s post by Fearghal Duffy contained a quote from Ovid that has for years made an imprint in my memory. Omnia Mutantur, Nihil Interit | All things are changing; nothing dies (Metamorphoses, Book XV). Reading Fearghal’s blog brought me back to the experience I had when I first watched Cave of Forgotten Dreams, a film that perfectly captures the essence of Ovid’s quote. Time (as we know it) does not exist in the paintings of Chauvet, nor does the idea of permanency. Rather, everything moves in a state of osmosis, transformation and flow. While today ‘we are locked in history’, Herzog narrates, ‘they were not’. Emancipated from linear, teleological time, the art created by these early humans opposes tightly integrated narrative time and the hegemony of chronology, allowing us to visualise how our ancestors perceived and inscribed the world in motion outside of the time-space continuum familiar to us. In Chauvet, the paintings adopt a distinct 3D form and display a vivid protocinematic imagination. 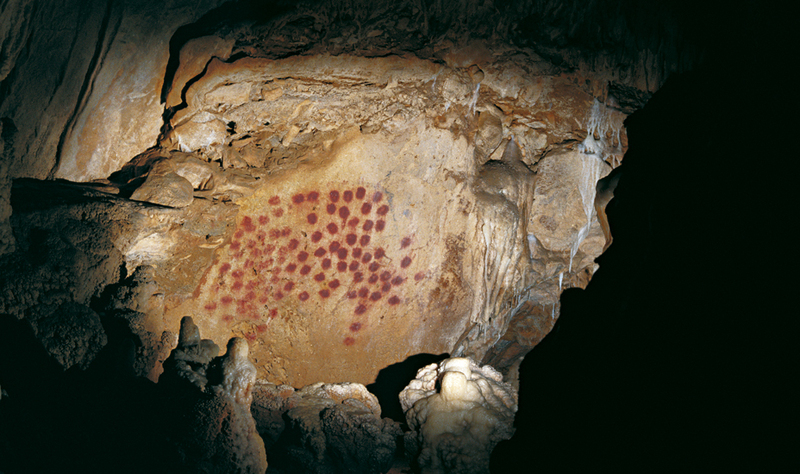 Their painters achieved this by using the curves and textured modulations of the spatial surface of the cave in harmony with painting techniques, such as depicting eight legs to emphasise motion and evoke a sense of multidimensionality. One experiences similar representational values in the frames of an animated film or in the practice of chronophotography. Lutz Koepnick compares the motion embodied within the paintings with ‘the flickering of early film projectors’, writing that for Herzog, ‘prehistoric cave painting … drew makers and viewers alike into hallucinatory experiences of dynamic motion’ (Kopenick, On Slowness, 130). Interestingly, Geneste points to Herzog’s camera at the end of the above scene saying that the camera enacts the same purpose as the prehistoric painter; it inscribes and communicates the memory onto a visual surface in order to communicate the future and evocate the past in a synergetic exchange. The work carried out by a team of archaeologists and scientists in the Chauvet cave is a powerful example of how interdisciplinary and collaborative research can function. 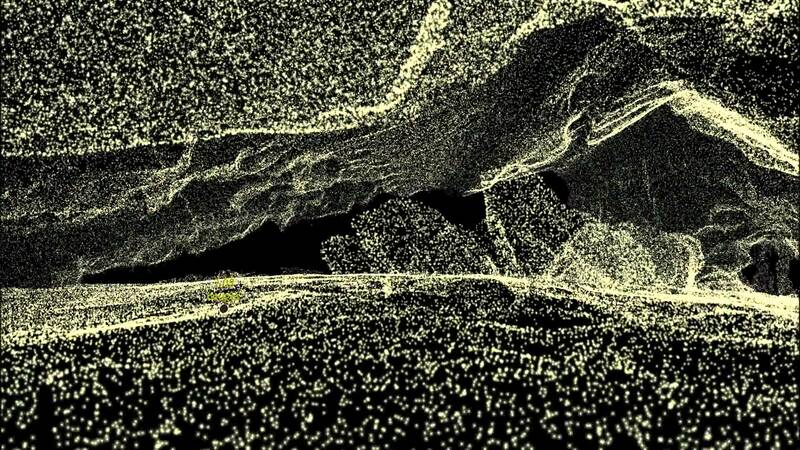 Mapping millions of spatial points with laser technology, the team have created a cartographic representation of the cave in its entirety, stretching 1300ft long. 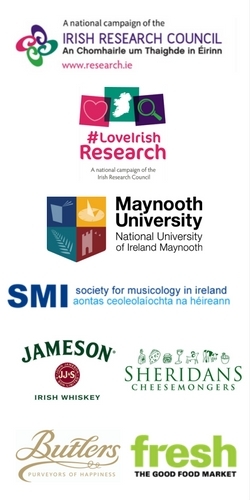 Their goal is not just to create a store of empirical knowledge, but to create a rich archive of stories that can tell us more about the practices and rituals of Palaeolithic life. Herzog is an art-maker who pushes past boundaries to ask questions – big questions. 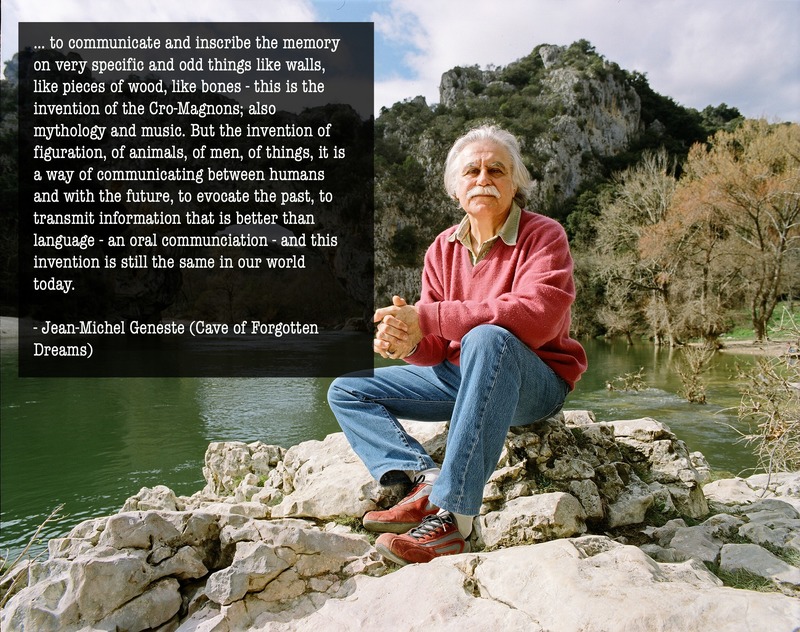 He probes the greater meaning of what it is to be human, to be cognisant, to be creative. He will not leave his audience pacified, but mobilised, inquisitive, and even at times uncomfortable. But this is the magic of cinema making. It is the same kind of magic that can be harnessed in collaboration, and that we hope to inspire in our project. I leave you today with a performance of the Cave of Forgotten Dreams score by eminent cellist and composer Ernst Reijseger. Reigseger’s musical fabric coheres the temporal unity and reenforces, as Tommy Flavin wrote in his last post, the ecstatic truth in many of Herzog’s films.